Marshfield Fair Amateur Radio Exhibit—A Resounding Success! 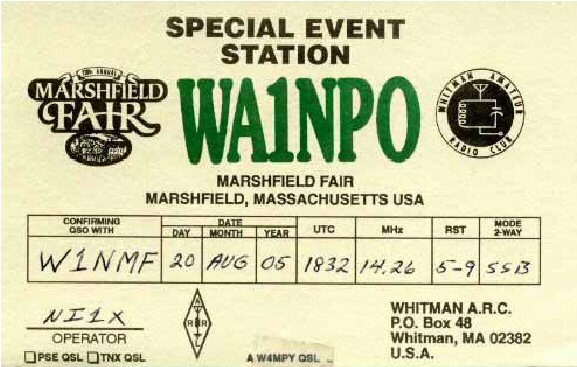 For ten days in August, members of the Whitman Amateur Radio Club staffed a special event station and Amateur Radio exhibit booth at the annual Marshfield Fair. Seventeen club members and four area hams volunteered for three-hour shifts, explaining Amateur Radio to the public and introducing youngsters to Morse code. The crew made approximately 150 contacts with 31 states, 15 foreign countries, and two Canadian provinces. 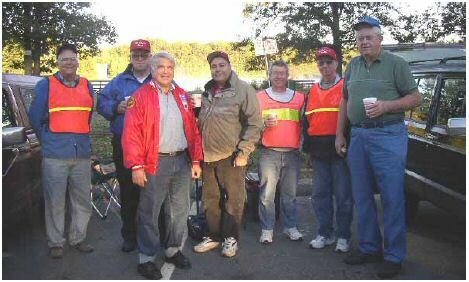 Members of the Massasoit Amateur Radio Association and area hams assisted with communications support for the D.W. Field Triathlon on September 25, 2005 at the D.W. Field Park in Brockton. Phil McNamara, N1XTB brought his portable “Go Kit” consisting of several boxed radios, a big battery contained in a plastic carrying case, and a solar panel. Pictured here (left to right): Bruce Hayden, NI1X; Gil Follett, W1GMF; Carl Aveni, N1FY; Bob Keene, Jr., N1LCY; Phil McNamara, N1XTB; Roy Logan, KB1CYV; Ed Meehan N1NTZ. Not shown: Walt Fitzgerald, N1LHD. The bi-annual Hosstraders Hamfest happens October 7-8, 2005 at the Hopkinton State Fairgrounds, off I-89, Exit 7, in Hopkinton NH. Check the Official Hosstraders web site for more information. The Sturdy Memorial Hospital Amateur Radio Club plans to offer a two-day Technician class targeted specifically at CERT members and Emergency Management Agency personnel, according to SMHARC President John Benson, N1FLO. SMHARC members KB5TBB and N1EZT have offered their services to teach the class. “We could still use a few more volunteers,” adds Benson. The Sturdy Memorial Hospital Amateur Radio Club recently donated $220 to the Red Cross for Katrina relief, writes SMHARC President John Benson, N1FLO. Benson wishes to thank all those individuals who helped contribute to the effort. 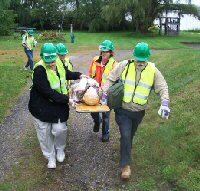 Members of a Scituate Community Emergency Response Team (CERT) held a graduation drill and a BBQ on September 17. The team includes several hams in its ranks: W1QWT, K1CWS and NS1N. [Full story]. Members of a Scituate Community Emergency Response Team (CERT) held a graduation drill and BBQ on September 17. The team includes several hams in its ranks: W1QWT, K1CWS and NS1N. W1QWT has been named Team Leader for the Scituate Center team, whose staging area is at the Scituate High School which doubles as the Town’s shelter. The Scituate fire chief has requested that Callahan further his skills by attending a future course in shelter management. The popular wholesale chain BJ’s stocks 72 hour emergency kits, reports Carl Aveni, N1FY. “[The kit] includes a three day supply of water, extra bags for storing more water, high energy food bars, a flashlight with batteries, a portable radio with batteries, plastic and tape for shielding windows, a rain poncho, small first aid kit, and a few other items I cannot remember,” writes Aveni, who is the Eastern MA District Emergency Coordinator for the South Shore. According to N1FY, the kit is enclosed in an orange backpack. They can be found in the automotive section of BJ’s. “Not all stores seem to carry it–I noticed that the Avon store did not seem to have it, for instance.” He adds that the Taunton store carries the kit. The cost is around $30. Bill Ricker, N1VUX presented on SKYWARN at the September 15, 2005 meeting of the Boston Amateur Radio Club in West Newton. 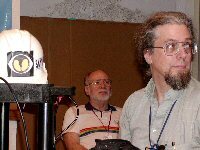 In addition to his club talks, Ricker, a long-time SKYWARN veteran, helps conduct many of the official SKYWARN training sessions throughout New England. Attendees included Eastern MA Section Manager Mike Neilsen, W1MPN. This is likely to be the last of the ham public service events for this year, so you can relax (except for the “real” disasters). This event was so good for the past four years that the Boston Athletic Association (BAA) Half Marathon is now in the category of “Fifth Annual.” The event got huge acclaim – largely because of the skills and experience of the organizers and support staff (we are definitely a part of that). The Half is run almost entirely in Boston (2% in Brookline), with about 5000 local, national and international athletes expected. Proceeds benefit the Jimmy Fund. Our team has been asked again to support communications for this event doing our usual medical, water and administrative tasks. We definitely need your help. Time is short. The Half Marathon will be held on SUNDAY, 9 OCTOBER 2005. Time and other details are below. The course is along the length of the “Emerald Necklace” (as beautiful as you can get in Boston). The out-and-back route starts and finishes at Clemente Field in the Fenway. It follows the Riverway, Jamaicaway, and Arborway to the Franklin Park Zoo for a turnaround and return on almost the same route. The weather is likely to be cool and the 13.1-mile course should not be a strain on the athletes. Water and medical stations are spaced appropriately. There are also assignments at several hazardous points. Our duties on the course will be to support these locations, but we also serve as observers of the runners, spectators and local residents (some of their streets are to be closed). Most stations serve both outbound and inbound runners. At Clemente Field, we have a number of fixed and roving medical assignments. If you are assigned to a station on the course, and you wish to drive, you may go directly to the assigned location. I hope to have a ham course Traveler who will deliver your identity (long sleeve) shirt. If you are willing to drive directly to your station on the course, I will send you a Vehicle Permit (as an email attachment in MS Word) for you to print out. Those assigned to course stations must be on site at 0700 so the Traveler can meet you briefly and move on. The Traveler will call your station as he approaches. Be ready and go to the Traveler’s car or bus for the ID shirt and any last minute information. If you do not plan to drive to an assigned course station, you must arrive at Clemente Field at 0600. A parking lot for volunteers only will be located about three blocks away from Clemente. You will receive an ID shirt and any last minute information. There will be transportation from Clemente to the course station assignments. Hams assigned to posts at Clemente Field must be present at 0700 for a briefing and the amenities. Keep in mind that parking in the Fenway area is limited, so allow time to find a space, use the volunteer parking lot, or take the T (if running at that hour – see www.mbta.com). The area is T accessible from several directions. Parking (at that hour) will also be available at the Landmark Center (formerly the Sears store) on Park Drive at Brookline Ave. There is a charge for the Landmark parking. The entire event should be over before 1130, and all roads will be (progressively) opened. This schedule is what is known now. Better details later. Because the entire course is so compact, very few repeaters need be used. Our present plan is to use both 2-meters and 70-cm, both bands with CTCSS. WE NEED YOU TO VOLUNTEER. As in the past, we are committed to reliable, professional performance, and the requirements below lead to this goal. Please note them and sign up quickly. Each ham must have his or her own radio and accessories – no sharing of equipment can be permitted during the event. Each ham must be self sufficient for the entire period, as we cannot assure partnered assignments. 1. For the duration of this event you are considered a member of the Boston Amateur Radio Club (BARC) and a BAA volunteer. BARC carries a liability insurance policy. 2. To assist in identification and security, you must wear a badge with your name and call sign. Your volunteer credential will be a special long-sleeve shirt provided at the beginning of the day and your bright orange “Emergency Communications” cap (available for $5.00 – let me know if you need one). 3. Our communications support is provided only by licensed Amateur Radio operators, Technician class or above. Be sure to have a good photocopy of your valid license with you. 4. Because of the terrain and expected radio traffic congestion, you should have a full size antenna (that is, better than a minimal “rubber duck”) and a battery supply sufficient to run at your maximum power if necessary. While you will mostly listen and rarely transmit, the best guide is for 10 hours of battery capability. The ambient noise level may be high, so an inexpensive headset (not just an ear plug) is strongly recommended. 5. To present ourselves as professional and proficient, you must be neatly dressed. The bright orange “Emergency Communications” cap is essential for identification. Local residents and the media will be watching. 6. Expect the media. If you are interviewed, state that you are an Amateur Radio operator, and give only a very brief statement about what your assignment is. Then refer the interviewer to our public relations staff (call Net Control for direction). Please do not offer prolonged descriptions of the joys of ham radio. More hams are needed. Please spread the word in your local club and to your on-the-air friends! Anyone interested should contact me directly. We also need you to understand that although we must call for more hams now, final staffing needs may not match the number of ham volunteers. Therefore, a very small possibility exists that we still may not be able to give everyone an assignment. As the event date gets closer, instead of formal briefings, those who volunteer will receive an email with the assignment, a detailed description of the assignment site and other information. If you can give this event your help, please contact me as soon as possible. We also need to know if your radio has 2-meters with CTCSS and if you have the 70-cm band. If you have any questions about participation, do not hesitate to contact me at once. Your best email address for last minute information. Can you open an MS Word email attachment? Are you available to drive, and, if assigned on the course (not assured), would you drive there directly? If you have already informed me that you are available, please reply to this message anyway. The Billerica Amateur Radio Society (BARS) is sponsoring a one day ham radio class to help you get your Technician class amateur radio license. Knowledge of the Morse code is NOT required for this class license. The class will cover all of the topics you need to know to pass the exam. Date will be Saturday November 19, 2005. Location will be the Murdock Middle school. 42 Brick Kiln Road, Chelmsford MA. The class will run from 9 AM to 6 PM. At 6:30 PM there will be a VE exam session where you can take the Exam to get your license. The cost of the class is $15. The $15 fee includes BARS membership for one year. The fee is waved for current BARS members and their family. The exam will cost $14.00. To prepare for the class it is recommended that you purchase and review the Book “Now You’re Talking!” 5th edition before the class. This book is available at HRO in Salem NH, on the web at ARRL.org and from Amazon.com. Please contact me if you wish to register for this class. Space is limited. People will be registered on a first come basis. The August, 2005 EMA traffic net and Public Service Honor Roll totals have been posted to http://nts.ema.arrl.org under “Main Menu | STM Monthly Report“. identify how you may serve and what equipment you may need to bring. welcome to send us postings. recent version of the PSLIST. Kuss Middle School Makes Successful ISS Contact! For those of you who did not hear yet, yesterday we had an absolutely perfect radio contact between the [International Space Station] and the Kuss Middle School (Fall River, MA) students. The entire pass was just under 10 minutes long, and the kids were able to ask 22 questions, and we lost signal right at the end of John Phillps’, the astronaut operating NA1SS, 22nd answer. We were set up in the Kuss library with about 50 people present, including Mayor Lambert, and Senator Menard who presented a citation to the Kuss students for their work. Frank Bauer, the ARISS coordinator, also flew into town to see our event. 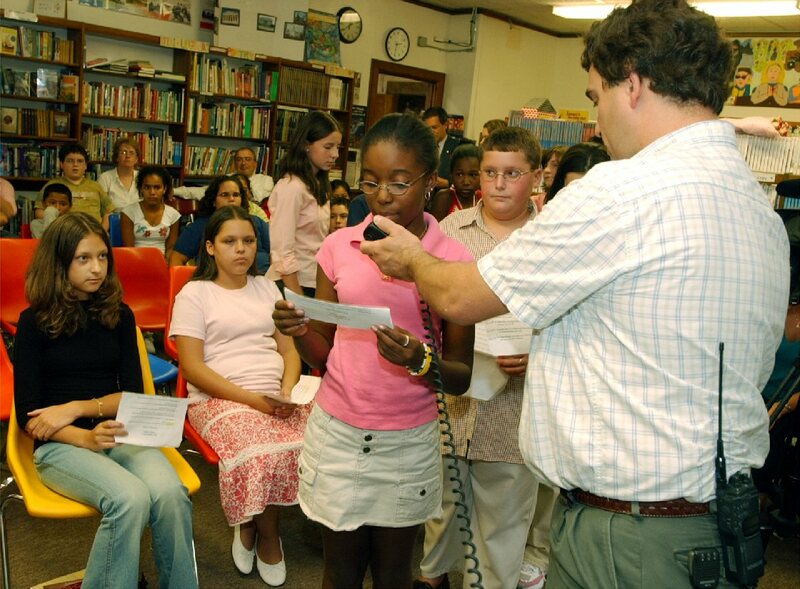 We had 12 students lined up with 2 questions each to ask, so almost every kid got 2 chances at the microphone. We also set up an ATV link to the church hall across the street where about 50 more people were watching our live video feed of the event projected onto a large screen. Needless to say, there were plenty of smiling faces at the end of the event. To show how seriously the Kuss faculty took this event, our contact began at 2:24 PM, and school let out at 2:30, about half way through our ISS pass. You would never had known there was anybody else in the school at 2:30! The school bells did not ring, the kids were asked to be quiet, and were only let out of the exits at the opposite end of the school. Security guards kept the front of the school clear of kids, and the Fall River PD had Rock street closed down! It was definitely an effort in noise control that worked perfectly! No outside noise was heard even though we had most of the library windows open to let some cool air inside. We used the schools equipment, which consisted of a Yaesu FT-847, Mirage 180 Watt brick amplifier, and an M-Squared 22 element 2 Meter cross Yagi. The antenna is turned by a Yeasu AZ/EL rotor, which we controlled with a laptop running Nova for Windows. There was also a backup station on hand, and luckily not needed. This consisted of an Icom IC-2100H 2 Meter mobile, my RF Concepts 170 Watt brick amplifier, and a Diamond X-500HNA vertical antenna. The school antenna is normally run into Joe Cote’s (KB1LJG) classroom on the 5th floor, but are easily extended to the library 2 floors down by attaching my portable satellite antenna umbilical cord as an extension for the coax cables and rotor control cables, which were conveniently wired with the same style connectors just for this reason. I want to thank everybody who helped to make this event possible and gave me unconditional support. Of course W2DAN, who has been there every time for the last 2 years. N1RHS & WA1ESO who were there Thursday night until 9:30 PM helping to set up the equipment. Also KB1CNA and WB1HGA who were there to assist on Friday. Also I cannot forget N1DU who donated some very cool commerative patches that were designed by the school, and he was able to embroider on short notice. Photos: Left: Senator Joan Menard and Mayor Ed Lambert present Shantae Martins (KB1LKW) a citation recognizing Kuss’s achievments. Right: Kathryn Cooper from Central Park Middle School in Schenectaty, NY, takes a turn asking her question. Next in line is Evan Darmondy, who was interviewed by TV Channel 6. Sitting are (left) Thalita Xavier (KB1MJP) and (right) Jennifer DeLeon (KB1MNK). Tony-VK3JED forwarded the criteria rainfall reports to the National Hurricane Center in Miami Florida via the webform. Special thanks to Tony for his efforts in forwarding the reports and monitoring the situation. Also, special thanks to Danny-KD4RAA and Kevin-KD5WX for the use of the IRLP reflector 9219 and the EchoLink *WX_TALK* Conference Server. I also want to thank Cape Cod ARES and SKYWARN for their tremendous efforts. We had almost 3 dozen stations check into a prep net on their local repeater last night and about a dozen stations check in on the ARES/SKYWARN Net throughout the morning. I’d also like to thank George-N1NBQ and Nick-K1NGJ for the observations from Nantucket and their support from the Nantucket EOC. While this was ultimately a miss from a damaging perspective in Souteastern New England, it served as a good exercise of the system and our local VHF/UHF operations as well as HF operations. Special thanks to the HF Net Controls who monitored this morning and for taking check-ins this morning and thanks to all SKYWARN Spotters and ARES/RACES/SKYWARN/MARS operators for their tremendous support and understanding on this tricky forecast that resulted in the storm’s worst impact missing Southeastern New England. There will be a multi-agency, multi-community exercise involving Lowell, Dracut and Billerica on Friday, 9/23 and Saturday, 9/24. Amateur Radio support has been requested for this drill. The major portion of the exercise will be conducted during the day time on Friday with additional events occurring on Saturday. Here is an opportunity for Amateur Radio to team up with police, fire, EMS, ambulance companies, hospitals as well as our common support roles working with the American Red Cross and community emergency management agencies. If you would like to part of this event, please let me know ASAP. Our role will depend entirely on how many of us are available. A Jamboree On The Air (JOTA) station will be operational at the Mansfield Emergency Operations Center, writes Allan Cox, K1VQ on the Sturdy Memorial Hospital ARC mailing list. “Exact staffing and hours of operation are not known at this time, but we plan to be open,” writes Cox. K1VQ asks if anyone has information on local events or knows activities at scout camps (such as Camp Norse) to contact him. JOTA is an annual event in which about 500,000 Scouts and Guides all over the world make contact with each other by means of Amateur Radio. The next JOTA event is scheduled for October 15-16, 2005. For additional information on the event, visit http://www.scout.org/wse/jota.shtml. At this time, Hurricane Katrina evacuees are being housed in our section, and there is a genuine possibility that some EMA ARES personnel may be called upon to deploy to the Gulf Coast. We remind our readers to watch for local news updates and disaster coordination messages on the Eastern MA ARES web site at http://ares.ema.arrl.org. A group of hams–including some Air Force MARS members in Massachusetts–are looking to help a blind amateur by locating a replacement for his IC-775 destroyed by a lightning hit. Chuck Councilman, W1HIS and Phil McNamara, N1XTB are among those involved in the search for a replacement rig for Bob Thibert, W9ARV of Ormond Beach, Florida. “We are helping Bob, W9ARV, a blind ham, to replace his Icom IC-775DSP which was irreparably damaged by lightning,” writes Stan Dicks, W4AG. “The 775 is not only a good radio; in addition, its optional voice synthesizer card does a very nice job of announcing the states/values of its settings/control variables.” Dicks says the undamaged voice-synthesizer card will be removed from W9ARV’s damaged 775 and installed in a replacement 775. “If you are interested in selling your 775, please let me know how much you want for it. I will get the word to Bob or give you his phone number so you can contact him directly.” W4AG can be contacted via email at w4ag@mindspring.com. ….Plan for Evacuees to be moved to Otis Air Force Base in Cape Cod, Massachusetts turned back on but with less evacuees…. ….Approximately 100 evacuees arrived Thursday Afternoon while another 100 evacuees arrived late Thursday Night/early Friday Morning…. ….Cape Cod Red Cross fully activated once again with Cape Cod ARES in stand-by mode. Does not appear messaging services are required for this operation at this time…. ….SATERN send a request nationally for 10 2-Ham Operator teams for deployment to the US Gulf Coast for Health & Welfare traffic services and Eastern Massachusetts ARES offers support for deployment along with remote support if needed…. Eastern Massachusetts ARES made contact via email with Jerry Schneller-N2HPO to offer the possibility of assisting with deploying teams at their request and offer remote traffic handling support to SATERN. Jerry sent a reply in capital letters with “THANK YOU” and that they were assessing their needs and would get back to us. My contact information was sent to Jerry and will await further feedback. Concerning an email sent to NN1N-David Patton, special assistant to the ARRL CEO, and W4OZK-Gregg Saratt, Alabama Section Manager on any assistance required for the affected area, no response has been received. On Sunday and Monday 9/4-9/5, N1XRS-Tony Duarte and I spent several hours monitoring the SATERN (Salvation Army Team Emergency Radio Network) Net on 14.265 MHz and the Health & Welfare Net on 7.290 MHz on 40 Meters when propagation allowed it via the SEMARA Club Station, W1AEC. The SATERN Net was successful in facilitating several rescues over the past couple of days and had liaisons to MARS contacts. That net has been dealing solely with emergency and priority traffic. Its not clear when the net will shift to Health & Welfare if at all. SATERN has setup a web site concerning health and welfare traffic at http://www.satern.org/ where you can search by name or fill out a Health and Welfare form. The Red Cross has provided a family links registry on their web site at http://www.redcross.org to try and reunite families. Special thanks to Jim Ward-N1LKJ, Section Traffic Manager, for providing this information. Jim Ward also reports that 16 NTS traffic messages have been handled and sent into the affected area as a Health & Welfare traffic. It is not clear if those messages reached their intended destinations. On Monday September 5th, Fox-25 in Boston was looking for a Ham involved in such operations and Jim Ward-N1LKJ was interviewed and featured on Fox-25 News at 10 for his efforts. Special thanks to Jim for agreeing to doing the interview given that he was involved in efforts that attempt to reunite loved ones. Eastern Massachusetts ARES made contact with Erin Sarris, Associate Director of Disaster Services Preparedness and Response, Sunday Evening September 4th. Thus far, only a small number of Red Cross personnel from Mass. Bay has been deployed. With the sheltering of evacuees taking place on Cape Cod, there is little direct involvement from Mass. Bay in that process. Mass. Bay Red Cross is not directly looking for communications deployments currently and recommended to continue following the ARRL/ARES path for deployments. Those that have already signed up via the email address of katrina@arrl.org have already been forwarded to the appropriate personnel per what is stated on the national web site so you do not need to sign up again using the database link provided above if you’ve already sent an email to the ARRL address. The database link http://katrina.ab2m.net/ will ask for similar information as what was asked for via the arrl.org email address. They will ask for name, call sign, contact information, equipment you can bring down and I’d also recommend providing training and previous experience in emergency communications for the mission in such a note. I would strongly recommend working through your ARES EC/DEC or myself before sending an email to that address. There are many things to consider including the fact that lodging and other conditions may be extremely poor and there will most likely be a lot of coordination issues given the fact that this is such a large disaster relief effort for served agencies to manage and our leadership wants to make certain you are aware of the risks and are fully prepared to be involved if you consider deployment. As Steve Schwarm, W3EVE, quoted from Westchester County Red Cross, “Blessed are the flexible, for they will not get bent out of shape” and this very true for this major relief effort. Once that is complete and if you decide to accept such a mission and have signed up on the database link provided above, please copy your ARES DEC and myself to such an email so that we know you are being considered for going to the region and keep us posted on whether you are accepted for deployment. That way our leadership can assist in communication to your family and friends if required. It will also help to make sure that we do not displace too many resources to the region. As I’ve stated previously, hurricane season is far from over and there remains an ever present threat through at least the first week of October of a hurricane striking our region. We also need to keep in the back of our minds that ever present threat of terrorism to our region and having resources available to tend to that unexpected threat if it occurs. Once again, there should be absolutely, positively, no self-deployments to the region. The situation down there is extremely tense and anyone who is down there without proper authorization despite their best intentions is likely to receive a very bad reception. Please work through our ARES leadership as we will continue to work very hard to keep you informed of changes in a situation that is changing by the hour and minute as the situation slowly becomes more stable and proper assistance can be provided. There are many other agencies providing support for this effort. The links above are intended to provide response information from 2 of the main agencies we deal with but there are dozens of others that are also providing support. I would also like to thank one Amateur who has sent information to ARRL via the email address for possible acceptance of deployment and notified me that he had sent a note concerning possible deployment. I would also like to thank another Amateur who cannot deploy himself but has offered equipment to help someone deploy who may not have the equipment required to deploy down to the region. These Amateurs are showing the spirit of Eastern Massachusetts ARES by offering to help and also providing the ARES leadership with appropriate information on the help that they are offering. That teamwork and support is very much appreciated! Please contact myself or your ARES DEC with any questions, comments or offers for support during this time period both here at home for any assistance that we can provide from here in the relief effort or for actual deployment to the affected area. On behalf of the entire Eastern Massachusetts ARES staff, we look forward to working with everyone to properly make a difference in this trying time for the United States caused by one of the worst natural disasters in the country’s history.